SACH'A There is 1 product. 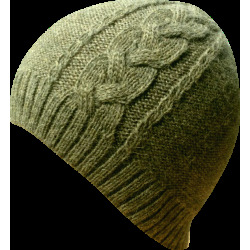 Cute beanie, with a braid detail on one side of it, knitted of 100% Baby Alpaca wool, light green melange, very versatile, extra soft and light. You will like to keep it on your head and will love it! FREE SHIPPING! Available in 3 different colours. All the Allpaqa products are packed using 100% recycled packaging.